Read what SMDM members have to say about how being a member of SMDM has enhanced their careers, their research and other aspects of their professional lives. "SMDM played a major role in helping me launch my career. I found my postdoc then my faculty position through the Society, and I continue to collaborate with many wonderful people who I first met at the annual meeting." "SMDM gave me priceless profitable experience at the intersection of multidisciplinary approaches in decision making that I've never had previously." "No other meetings compare to SMDM’s." 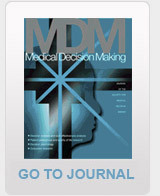 "Attending SMDM Meetings has sharpened my research and presentation skills." "It has been a pleasure to be a link between Brazil and my colleagues from around the world through conferences, teleconferences, short-courses and exchange of ideas." "SMDM is my professional home, providing an excellent forum to maintain connections with colleagues and venue to distribute and consume methodologically rigorous, multidisciplinary research." "SMDM has been my professional home for about 20 years now." "I never felt that I was a newcomer even though I was"
"The most benefits I get from the membership are getting informed of up-to-date information on health decision making as well as resources and tools for professionals in this area." SMDM short courses helped me to understand the multidimensional perspective and comprehensiveness of decision science. "While my research is more methodological, I fully appreciate the exposure to clinical applications I get at SMDM." "My involvement in SMDM has led to new perspectives I do not find anywhere else"
"From a technical perspective, solving problems requires both an open mind and sharp skills.The rigorous and multidisciplinary approach of SMDM has helped me expand my toolset for solving important and interesting problems."